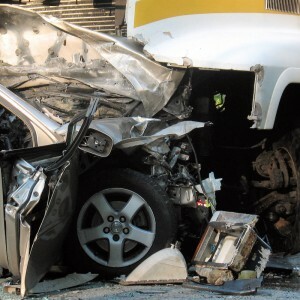 Underride and override accidents are some of the most devastating types of truck accidents, often resulting in fatal injuries for occupants of smaller passenger vehicles. And those who do survive often suffer permanent, life-altering injuries. When a vehicle is somehow forced underneath the trailer of an 18-wheeler or tractor-trailer, we refer to it as an underride or an override accident. Why does this happen? The front end of most passenger cars is roughly 30 inches above the ground at its highest point. The bottom of a trailer is often 45 inches above the ground or more. This 15-inch height difference makes it easy for a passenger vehicle to pass under a truck. Basically, an underride accident occurs when a passenger vehicle slides underneath a truck; an override is when a large truck runs over a smaller vehicle. An underride accident occurs when a vehicle becomes trapped beneath a tractor-trailer from either the sides or the rear of the truck. These accidents are often deadly for those in smaller vehicles because the point of impact happens right at head level. Despite having airbags or other safety equipment, passengers often suffer severe head trauma, spinal cord injuries, paralysis and even decapitation. An override accident occurs when a smaller vehicle is run over by a large commercial truck, typically shearing off the top of the car. Sometimes the smaller vehicle can be dragged by the larger truck before stopping, which can expose passengers of all vehicles involved to additional hazards such as fire, fuel spillage or hazardous loads. Our goal is to help you and your family put your lives back together by obtaining the compensation you deserve, especially if the consequences involve a wrongful death. In the Kansas City area and across Missouri, when you have been seriously injured in an underride or override accident, you need a trusted and experienced resource who will fight for your rights. Contact the truck accident attorneys at Nash & Franciskato for a free, no-obligation evaluation of your case.